by Brianna Crandall — November 14, 2018 — Silicon Valley-based Tigo, pioneer of the smart modular Flex MLPE (flexible module-level power electronics) platform operating worldwide, just announced its new RSS (Rapid Shutdown System) Transmitter to complete its cost-effective rapid shutdown system architecture for solar photovoltaic (PV) modules when paired with TS4-F (Fire Safety). Tigo’s RSS Transmitter accompanies the UL-certified TS4-F (integrated) and TS4-R-F (retrofitted/add-on) solutions. See the link below for today’s webinar on the new product. The RSS Transmitter sends a signal to the TS4-F units to keep their PV modules connected while powered on and supplying energy. TS4-F units automatically enter rapid shutdown mode when the RSS Transmitter is switched off and resume energy production when power is restored to the RSS Transmitter. This solution complies with US National Electric Code (NEC) article 690.12 specifications for 2014 and 2017 to improve electrical and fire safety hazards for first responders, and supports the SunSpec-defined signaling for rapid shutdown with power-line communication (PLC). The TS4-F units and RSS Transmitter require no commissioning process. Providing a UL-certified transmitter to complete our second TS4 System Architecture solution for rapid shutdown has been Tigo’s largest contribution to safer solar. Tigo’s RSS Transmitter is the only SunSpec keep-alive device for rapid shutdown with PLC in the solar market today. We are excited to be shipping and certifying with a large number of tier one inverter manufacturing partners by the end of the year. 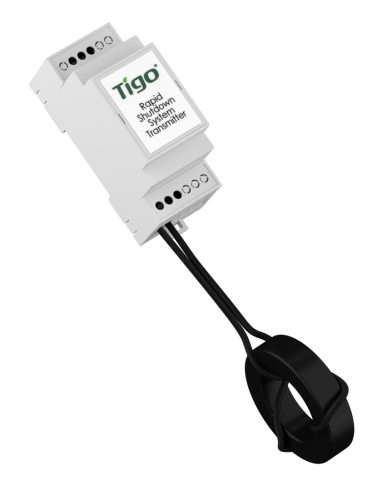 Tigo is currently taking orders for the RSS Transmitter — available as a Kit, DIN Rail, or PCBA. For price and delivery of the RSS Transmitter, visit the Tigo website. For price and delivery of the TS4-F products, consult your preferred solar PV supplier. To learn more, join Tigo’s live RSS Webinar on November 14 at 10 am PT. Get the latest data for renewable energy from this DOE report — now including electric vehicles and energy storage technologies March 20, 2019 In "Surveys and Trends"